Whether clambering up your your local trail or embarking on a well-planned trip up a mountain, one thing is certain: you’ll need trustworthy footwear. A pair of sturdy hiking boots is often the first thought. But for casual trekkers, hiking boots are too clunky. Worst yet, they’re inconvenient and often uncomfortable, taking forever to lace up and leaving little room for ventilation. Why not embrace hiking shoes instead? They’re far more versatile: rugged yet light, while still providing the grip you need to trek through tough terrain. Unfortunately, not all men’s hiking shoes are created equal. Let me help you pick out the perfect footwear for your trip with this comparison of the best hiking shoes for men of 2018 including a quick buyer’s guide. Looking for something with more support? Check out our recommendations for the best hiking boots for men! When figuring out how to choose the perfect pair of hiking shoes for men, you’re certainly not spoiled for choice. Several brands stand out in the market, among them Merrell, adidas, Salomon, and KEEN. In the end, much of your choice will come down to preference and fit. Brands like adidas pride themselves on a more modern, sportier look while others, like KEEN, offer a more traditional outdoorsy style. Looking for some kicks for your female travel buddy? Also check out our top picks for the best hiking shoes for women! Hiking shoes don’t often get more comfortable than the Merrell Moab Ventilator. The shoe prides itself, as the name suggests, on its high-breathability. The leather and nylon combination adds ventilation and flexibility, while the lining absorbs heat and moisture in warm conditions. 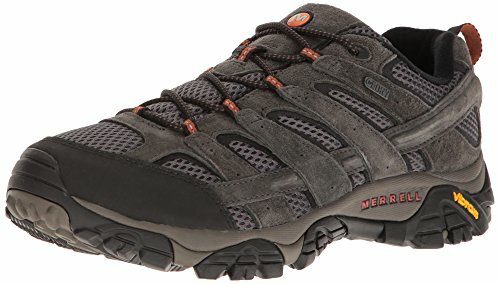 I recently tested a pair of these on my trip to Colombia and was pleasantly surprised at how well the Merrell Moab Ventilator kept my feet dry compared to other shoes I’d worn in the past. The Moab Ventilator is also surprisingly comfortable. I’ve had to use after-market insoles in the past, but with the Moab Ventilator this wasn’t necessary. The compression-molded footframe and air cushion midsole on the Moab Ventilator provide constant support and comfort. Even the heel has pockets of air cushioning for added stability on rocky or uneven terrain. Combine that with the thick mesh tongue that helps spread the pressure on the top of your foot and this is one comfortable hiking shoe. The outsoles on the Moab Ventilator are thick, crafted with a Vibram Multi-Sport TC5+ rubber compound that offers outstanding traction on tougher terrains. Even with a durable outsole the Merrell Moab Ventilator is surprisingly light. I wouldn’t go as far to say this shoe would stand up well to extremely rugged terrain such as sharper volcanic rocks. For simple day hikes, however, the trade-off between breathability and durability is worthwhile. The Merrell Moab Ventilator is perfect for travellers walking or hiking in warmer conditions. 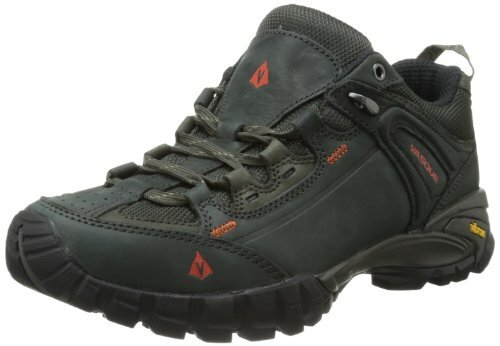 These would be the perfect hiking shoes for day hikes in hot, dry places like Petra in Jordan. You’ll really appreciate the breathability when you remove the shoes at the end of the day. The Moab Ventilator’s traction is also impressive for summer day hikes into rocky terrain. 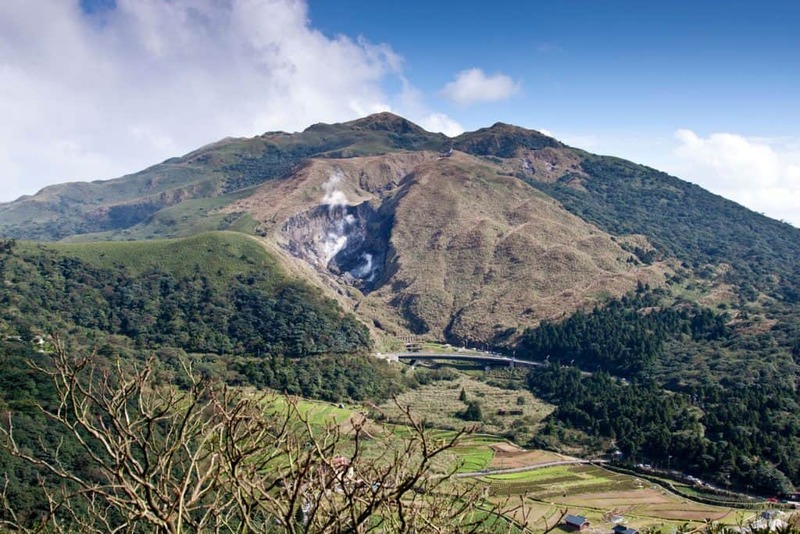 The material of the rubber toe is not suitable for long-term hiking or really tough terrains. I wouldn’t wear this shoe to hike in a place like Iceland, for example, where the terrain is jagged and uneven. It’s unlikely the toe would last long in conditions like this. The Moab Ventilator is also not suited for wet climates. The added breathability sacrifices watertightness. If you step into a puddle or get caught in a rainstorm, your feet will get wet. For travellers who love venturing into nature, the KEEN Targhee II are excellent hiking shoes. Like the Moab Ventilator, the Targhee II is very breathable and cools your feet in warmer temperatures. The KEEN.DRY membrane keeps your feet dry by allowing the sweat to evaporate from the shoe. The Targhee II has a dual-density compression-molded EVA midsole that provides good support for the feet. The heel support is higher than on most men’s hiking shoes. If you have weaker ankles or require more ankle support to trek over uneven terrain, the Targhee II is one of the better choices in the mix. The lacing, too, holds the shoes secure and is surprisingly easy to get in/out of. The traction on the Targhee II was designed for the most tenacious of grounds, thanks to the thick rubber outsoles and multi-directional lugs. Nylon shanks also provide you with more protection for hiking on uneven terrain. The rubber toe guards are designed to be impact-resistant. I wouldn’t go as far as giving something a swift toe-kick to test out the theory, but it should hold up in most regular hiking conditions. The KEEN Targhee II are suitable for light hiking and walking. They are waterproof, yet breathable, and should hold up if you’re planning to trek in damper conditions. With the KEEN Targhee II, there’s a tradeoff between comfort and durability. While the EVA footbeds add generous cushioning, the outsoles do not have a particularly long life. 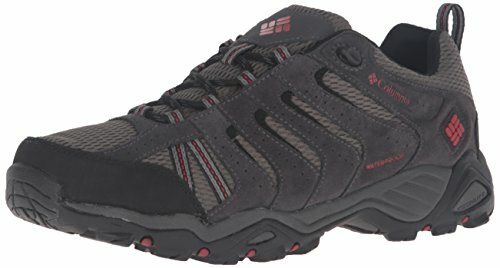 These hiking shoes would not be suitable for long multi-day treks where you would need something more reliable and robust. 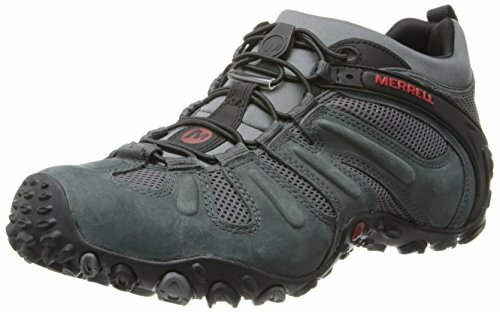 The Merrell Chameleon Prime Stretch are simple hiking shoes for men that pride themselves on their breathability. The combination of mesh and leather on the upper helps keep the inner materials dry. For hikers concerned with comfort, the Merrell air cushion in the heel absorbs shock and adds overall stability to the shoe. The rubber outsole includes M-Select Grip technology that adds powerful traction when dealing with rough, uneven terrain. The Merrell Chameleon Prime Stretch is best suited for short-range hikes and day hikes. The biggest advantage of this hiking shoe is its comfort and breathability, making it an excellent choice for warmer climates. The Chameleon Prime Stretch is not waterproof, so hikers planning to trek in wet conditions should look elsewhere. 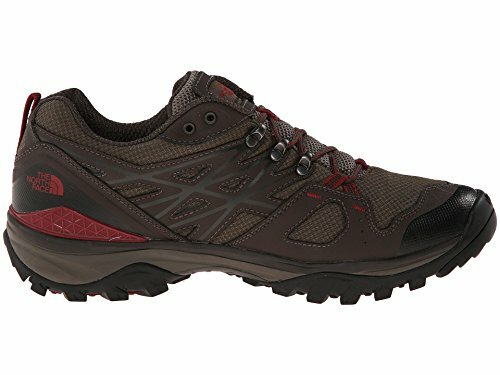 These hiking shoes are not well-suited towards hiking in difficult conditions as the materials are designed to be breathable rather than robust. The adidas Outdoor Terrex Swift R GTX is a mountain sportsmen favourite, built with toughness in mind. The mesh and synthetic uppers give the shoe protection from abrasions while maintaining breathability. A rubberized toe box increases the Terrex Swift R GTX’s durability. The traction on the Terrex Swift R GTX is excellent, but the best part of the sole is adidas’ adiPRENE cushioning. The technology absorbs shock and adds huge comfort. The Terrex Swift R GTX also has a quick lacing system, perfect for getting you out the door quicker. There’s even a way to tuck the laces in so that they won’t bother you on your hike or walk. Let’s not forget that the Terrex Swift R GTX uses Gore-Tex liners to make it 100% waterproof. 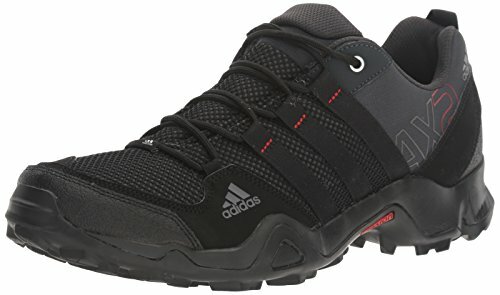 Hikers looking for an all-around shoe, whose use extends beyond just hiking, will love the adidas Outdoor Terrex Swift R GTX. In damp conditions, this hiking shoe is one of the best performers. It might feel a little warmer in hotter conditions, but will keep your feet dry from external moisture. The Terrex Shift R GTX can be a bit narrow – especially around the toe section – so hikers with wider feet might want to consider buying a pair one size larger or shop around for a different model. The Salomon X Ultra Prime is made for hikers who need to hustle on rough terrain. The shoe’s Contragrip technology delivers superb traction over a wide range of surfaces. Ultra-lightweight design and breathability increases coolness, dryness and comfort. The X Ultra Prime’s Sensifit upper creates a comfortable and correct fit on your feet. The lightweight and breathable upper is surprisingly robust, offering excellent protection against abrasions. Between the midsole and outsole lies Salomon’s advanced chassis, a lightweight footframe that increases stability. The insole is comfortable out of the box, and removable if you require a custom orthotic. (Although you might want to move up a size as the shoes are made small). 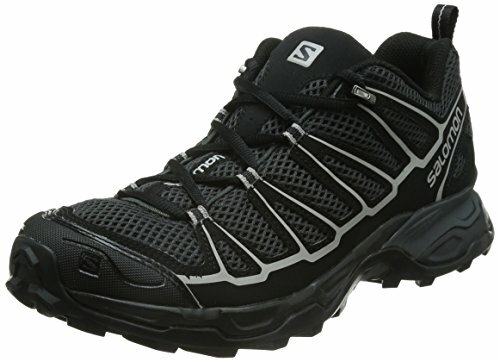 Hikers and backpackers looking for an all-around comfortable and durable shoe should consider the Salomon X Ultra Prime. Although they aren’t waterproof, the X Ultra Prime dries quickly, making them a good alternative if you foresee getting caught in a rainstorm or stumbling upon swampland. If you need to hike in wet conditions, you should look elsewhere. The Salomon X Ultra Prime is not waterproof. They are also made narrow and are unsuitable for those with wider feet. Extreme versatility lies at the heart of The North Face Men’s Hedgehog Fastpack GTX. Not only is the Hedgehog one of the best lightweight hiking shoes out there, it’s one of the top picks for tackling wet trails and less-than-optimal weather conditions. The waterproof barrier comes courtesy of Gore-Tex® and repels the elements as well as expected from the world’s top membrane manufacturer. And the Hedgehog Fastpack GTX’s performance in the rain doesn’t stop there. A Vibram® outsole ensures excellent traction on all surfaces, whether bone-dry or wet. The shoe’s structure is bolstered by a dual-density, compression-molded EVA midsole. Strapping the Hedgehog on for a jaunt, your stride is kept natural using the The North Face’s CRADLE™ GUIDE technology that’s designed to secure your heel in place. Anyone looking to shed a couple ounces in their travel backpack without trading in other essential features should give The North Face Hedgehog Fastpack GTX a hard look. The shoe’s excellent performance in wet conditions and on damp terrain is enough to give it a thumbs up for active travellers. Don’t be surprised if you find the sizing of the Hedgehog a tad tight. They are made a little smaller than normal. Those with wider feet will need to look elsewhere to find something comfier. The in-built insoles are a bit of a drag on the Hedgehog as well. Options from Merrell and Salomon tend to offer better foot support out-of-the-box. If you’ve ever had problem feet, you’ll probably need to jam in an after-market insole to provide better heel and arch support. With the smaller sizing, expect to move up a size to fit them in. If you’ve grown weary of the hiking shoes that look like they only belong in the wild, the clean design of the Vasque Men’s Mantra 2.0 is refreshing. 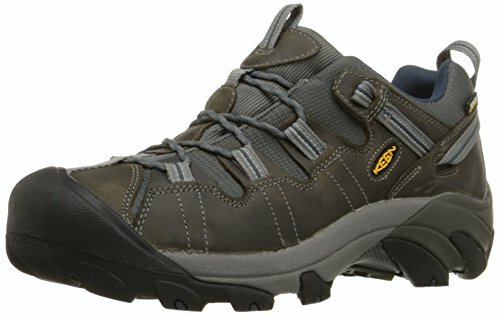 And it’s precisely their combination of streamlined style and durability that keeps avid hikers coming back to this top low-cut hiking shoe. The mesh and Nubuck leather upper of the Mantra 2.0 is one of the most robust in our picks, standing up to whatever nature throws at it. When hiking over uneven terrain, you’ll cherish the reliable traction of the Vibram Nuasi outsole (at least in drier weather) and the extra stability in the midsole. The secret lies in Perpetuum last used to form the shoe. It’s designed with a tighter heel and instep to keep your feet firmly in place. Long-distance hikers will love the Vasque Mantra 2.0. The leather and mesh upper is durable yet breathable, providing comfort over longer periods of time. The Mantra 2.0’s Perpetuum last is a favourite for those with lower arches and narrower feet. Even with its wider incarnation, anyone with wide feet will feel that the Vasque Mantra 2.0 is a little too snug. There’s a waterproof version of the Mantra 2.0, but the performance of the Vibram Nuassi’s outsole in wet conditions leaves something to be desired. If you’re keen (no pun intended!) on breathability, pop on the KEEN Men’s Voyageur. The Voyageur is a near-copy of the Targhee II, one of the best waterproof hiking shoes out there, with the moisture-proof barrier swapped out for a mesh lining. The result is a comfortable and airy shoe that performs better than most in warmer conditions. Multi-directional lugs on the rubber outsole grip uneven terrain on the fussiest of trails for a smooth hiking experience. The midsoles support your feet through a dual-density, compression-moulded EVA footbed. They’ve even added the Keen S3 heel-stabilizer and an ESS torsion-stabilizing shank to keep your stride moving forward with ease. 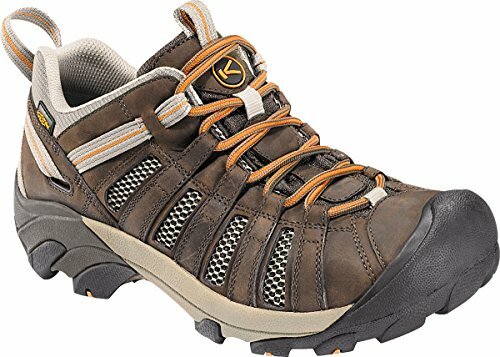 Hikers planning to tackle dry trails in warmer climes will love the extra dash of breathability provided by the KEEN Voyageur. The moisture-wicking lining adds even more comfort, drawing the sweat away from your feet to keep odours and dampness at bay. A lack of a waterproof membrane means that the Voyageur is not the best choice for hiking in damp places like the Pacific Northwest. A better choice would be the Voyageur’s close bro, the KEEN Targhee II, whose waterproofing prowess will keep your feet dry in the rain, even though it sacrifices a little breathability. Looking for an all-around hiking shoe that won’t bite too far into your travel budget? The Columbia Men’s North Plains II could be your new best travel buddy. Getting a hiking shoe at this price often means sacrificing durability and features. Although we won’t claim that this shoe will suit everyone, Columbia clearly focused on upping the value with this solid performer. The Omni-Grip rubber soles on the North Plains II are chocked with lugs that grip the terrain to keep you stable. Staying comfortable isn’t difficult either with the Techlite midsole. 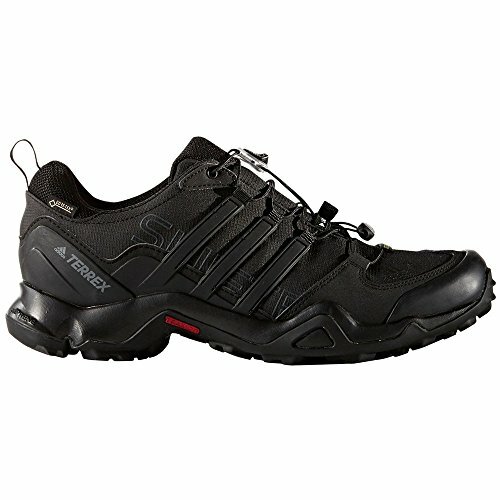 It cushions your feet impeccably on long or short treks, driving you to explore the trails even further. And even with all these features, the Columbia North Plains II drops in at just 12.6 ounces, slotting it in as one of the best lightweight hiking shoes at its price point. If price is your main concern, you won’t be disappointed with snagging yourself a pair of Columbia North Plains II. These shoes are also remarkably light, adding less than a pound to your baggage. They’re a great choice for minimalist travellers on a budget. As excellent as the value is, there are better performers than the Columbia North Plains II in terms of stability and durability. With its lightweight construction, however, expect certain trade-offs. The North Plains II, for example, isn’t well-suited for heavy backpacking. Other shoes like the KEEN Targhee II will provide more support in these situations. Despite its billing, the North Plains II are more water-resistant than waterproof. Spend a little more on a shoe like The North Face Hedgehog Fastpack GTX for better performance in wet weather. The name of the Merrell Men’s Moab 2 Waterproof should immediately give away why we’ve chosen to stack three Merrells here. The Moab 2 offers more than just comfort and durability; it’s one of the best waterproof hiking shoes you’ll find anywhere. What we love most about Merrell shoes is the excellent foot support right out-of-the-box. The M Select™ FIT.ECO+ EVA footbed on the Moab 2 Waterproof is contoured for a extra boost in arch and heel support. Even if you have trouble with your feet, you may find after-market insoles unnecessary. Besides the well-supported footbed, let’s not forget about the Vibram® TC5 outsole that, in addition to its durability, keeps you steady on your feet over varying terrain. Unlike many other companies, Merrell uses it’s own M Select™ DRY membranes for waterproofing rather than Gore-Tex. It doesn’t just keep your feet dry from the outside, but adds a degree of breathability to allow sweat vapours to escape. The obvious target audience for the Merrell Moab 2 Waterproof are hikers planning to trek outside in damp conditions. For hiking in places like the Pacific Northwest or Taiwan, these shoes will be your best carry-along footwear. As comfortable as the insoles are, those with wider feet may find the design of the Moab 2 Waterproof limiting. In the past several years, Merrell has noticeably narrowed the toe box and midsole. The materials on the insole and outsole are also a little stiffer than in the past. For some feet, top waterproof picks like the Salomon X Ultra 2 GTX may feel slightly more comfortable out-of-the-box. Sporting a look more at home in the city than the outdoors, the adidas outdoor Men’s Ax2 is a versatile hiking shoe that’s bound to turn some heads. The flashiness doesn’t end at the bright and bold designs; performance on the trail—and off—are also top-notch. A cloud-like adiPRENE® foam complements the EVA midsoles, cradling your feet and absorbing shock for maximum comfort. The synthetic mesh outer complements, rather than restricts, the shoe’s coziness; it’s highly breathable, providing nice airflow for your feet as the mercury climbs. For traction, adidas threw on its own TRAXION® outsoles. Even in wet conditions the Ax2 grips remarkably (although we can honestly say that the shoe itself isn’t the best performer in the rain). All this while saying lean. At just 10.9 ounces, the adidas Ax2 slides quietly into your luggage. Actually, it’s not much heavier than a lightweight waterproof jacket! When style is a concern, the adidas outdoor Ax2 is one of the cooler hiking shoes on the block. 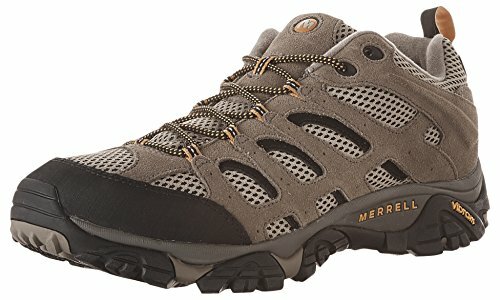 Its snazzy colours and sporty design are a certain step up from the more outdoorsy offerings of Merrell or KEEN. The light weight is a huge plus for anyone wanting to tag along a set of hikers without tipping the airport scales. At under $100, the Ax2 is also budget-friendly. Out in the rain? You’ll want to look elsewhere. The adidas outdoor Ax2 is designed to be lightweight, not waterproof. They’ll hold up in a light rain, but not much more. As a lightweight and budget hiking shoe, don’t expect the durability to compare with the likes of Merrell or Salomon. While it isn’t going to win any style awards, the Ahnu Men’s Coburn Low Waterproof fulfills its promise to travellers as a solid performer on the road. You’ll love the shoe’s ability to trek over long distances without pushing your feet towards fatigue. To jack up the comfort, Ahnu added numentum® technology to the midsole of the Coburn Low Waterproof. It’s designed specifically for the movement of hikers and walkers, centering the foot to nudge you towards a more natural stride. Over uneven terrain, the spider lugs on the rubber outsole help you keep your balance and maintain your traction as you ply the trail. Any traveller who loves to spend more time on the trails than the streets should slide the Ahnu Coburn Low Waterproof into their backpacks and get themselves deep into the wild. The excellent traction and stability is at home on the hiking trails. The durable and waterproof leather upper helps the shoe’s case, too. 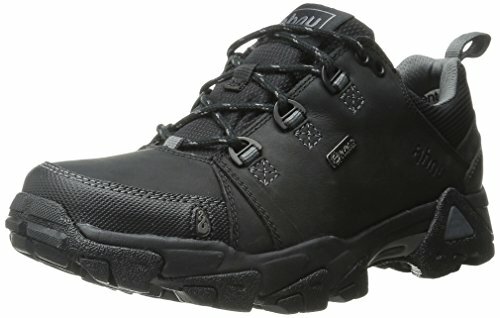 The work-shoe-like appearance of the Ahnu Coburn Low Waterproof doesn’t bode as well in urban environments where a comfortable and stylish walking shoe could serve you better. Although it’s billed as waterproof and breathable, expect the former to be the more important of the two attributes. You might find the shoe a little sticky in warmer climates, not much of a surprise as enhanced waterproofing almost always comes at the expense of breathability. Uppers: The material on top of the hiking shoe that covers the foot. Uppers affect the shoe’s weight, breathability, durability and water resistance. Midsoles: The part in middle of the shoe sole that provides cushioning, protects your feet from shock, and determines the stiffness of the shoe. Outsoles: The outer part of the sole that’s in contact with the ground. Outsoles are made of rubber, and, depending on material type, will decide the traction levels of the shoe. Most good outsoles feature little (or big) nubs called lugs that help to increase traction and improve stability. Before you can choose the perfect men’s hiking shoes, you need to consider what type of trips you’re planning to take. Hiking shoes don’t offer nearly as much support as hiking boots. If you plan to haul around a heavy travel backpack or jaunt through tough terrain, hiking shoes are probably not your best option. Even if you don’t carry around much weight, marathon hiking sessions will wear out most hiking shoes quickly. Hiking shoes are better suited for casual day hikes and walking than epic multi-day treks. For serious hiking, you’re almost always better off with a good pair of hiking boots. The extra ankle support and more robust outsoles sacrifice comfort, but are necessary for durability and protecting from injury on tougher hikes. It also goes without saying: You need to find hiking shoes that fit properly. Not every pair is equal for every foot. If you need to insert specialized insoles, for example, not every brand may accommodate it. Some brands are made narrower and slightly smaller. You may find yourself needing to add a half or full shoe size to ensure a proper fit with your special insoles. Hiking shoes, with or without orthotics, should feel snug, and shouldn’t slide around. Most importantly, your heel should not lift off the foot bed. This could lead to a serious injury on rough terrain or cause painful blisters, a trip-ruiner to say the least!